We don’t do Retail Sales. Minimum Order Quantity:- 100 meters. We export High Temperature cables to Afghanistan, Albania, Algeria, American Samoa, Andorra, Angola, Anguilla , Argentina, Armenia, Aruba, Australia, Austria, Azerbaijan, Bahamas, Bahrain, Bangladesh, Barbados, Belarus, Belgium, Belize, Benin, Bermuda, Bhutan, Bolivia, Bosnia-Herzegovina, Botswana, Bouvet Island, Brazil, Brunei, Bulgaria, Burkina Faso, Burundi, Cambodia, Cameroon, Canada, Cape Verde, Cayman Islands, Central African Republic, Chad, Christmas Island, Cocos (Keeling) Islands, Colombia, Comoros, Congo, Congo, Costa Rica, Croatia, Cuba, Cyprus, Czech Republic, Denmark, Djibouti, Dominica, Dominican Republic, Ecuador, Egypt, El Salvador, Equatorial Guinea, Eritrea, Estonia, Ethiopia, Falkland Islands, Faroe Islands, Fiji, Finland, France, French Guiana, Gabon, Gambia, Georgia, Germany, Ghana, Gibraltar, Greece, Greenland, Grenada, Guadeloupe (French), Guam (USA), Guatemala, Guinea, Guinea Bissau, Guyana, Haiti, Holy See, Honduras, Hong Kong, Hungary, Iceland, India, Indonesia, Iran, Iraq, Ireland, Israel, Italy, Ivory Coast (Cote D`Ivoire), Jamaica, Japan, Jordan, Kazakhstan, Kenya, Kiribati, Kuwait, Kyrgyzstan, Laos, Latvia, Lebanon, Lesotho, Liberia, Libya, Liechtenstein, Lithuania, Luxembourg, Macau, Macedonia, Madagascar, Malawi, Malaysia, Maldives, Mali, Malta, Marshall Islands, Martinique (French), Mauritania, Mauritius, Mayotte, Mexico, Micronesia, Moldova, Monaco, Mongolia, Montenegro, Montserrat, Morocco, Mozambique, Myanmar, Namibia, Nauru, Nepal, Netherlands, Netherlands Antilles, New Caledonia (French), New Zealand, Nicaragua, Niger, Nigeria, Niue, Norfolk Island, North Korea, Northern Mariana Islands, Norway, Oman, Pakistan, Palau, Panama, Papua New Guinea, Paraguay, Peru, Philippines, Pitcairn Island, Poland, Polynesia (French), Portugal, Puerto Rico, Qatar, Russia, Rwanda, Saint Helena, Saint Kitts and Nevis, Saint Lucia, Saint Pierre and Miquelon, Samoa, San Marino, Saudi Arabia, Senegal, Serbia, Seychelles, Singapore, Slovakia, Slovenia, Solomon Islands, Somalia, South Africa ,Taiwan, Tajikistan, Tanzania, Thailand, Togo, Tonga, Tunisia, Turkey, Turkmenistan, Tuvalu, Taiwan, Turkey, Vanuatu, Venezuela, Vietnam, Yemen, Zambia & Zimbabwe. 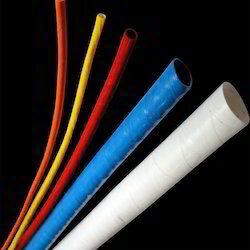 PTFE Sleeve that are reckoned for high dielectric strength. Manufactured from cutting edge technology our product in this category is highly sought after for such features as durability, dimensional accuracy and perfect design parameters. The range, in addition is resistant to abrasion, heat and wear and tear. All 11 solid standard colors and Natural opaque. Bicolor and color Stripping is also available. From -ve 65°C to +ve260°C. We Bhuwal Cables offer a comprehensive range of Fibre Glass Silicon Coated Sleeves Class - H. Available in most competitive prices, our range of products can be customized as per the clients' preferences. It is a compound material with high quality of performance. It has been widely used in spaceflight, chemical industry, petroleum, large generating electricity equipment, machinery, electric insulation, construction, oil pipelines and other fields. In keeping with various industrial needs and the ever-increasing demand to produce exceptional products, Bhuwal Cables Limited, supplies and exports innovative Silicone Coated Sleeve. It is also known as Silicone Coated Fiberglass Sleeve, Fiber Tube and Silicone Rubber Fiberglass Casing. Made with superior materials, the fiber tube is capable of maintaining its flexibility in high temperature. Constructed with the use of inflammable materials, it is fire resistant too. Besides, it has been engineered to be highly durable as it is equipped to resist against moisture, damaging chemicals. It has the ability to shield molten splash and welding splatter. In harmony with the various demands we manufacture the silicone coated sleeve in several models and designs. With all the latest features and modern technologies, the fiber tube is unsurpassed purely based on performance. It is used as protection sleeve in many applications such as, industrial hoses, cables and wire, aviation and marine fuel. To meet the variegated requirements of clients, we offer a complete range of Cable Sleeves. These sleeves are mainly used for repairing the damages on the cable. They also provide corrosion protection to the metallic parts of the cable that are exposed to polluted environments. The offered product is pre-tested on various parameters by our quality check team to ensure their flawless performance. We provide this product to our clients at nominal rates. In keeping with various industrial needs and the ever-increasing demand to produce exceptional products, Bhuwal Cables, supplies and exports innovative Silicone Coated Sleeve. It is also known as Silicone Coated Fiberglass Sleeve, Fiber Tube and Silicone Rubber Fiberglass Casing. Made with superior materials, the fibre tube is capable of maintaining its flexibility in high temperature. Constructed with the use of inflammable materials, it is fire resistant too. Besides, it has been engineered to be highly durable as it is equipped to resist against moisture, damaging chemicals. It has the ability to shield molten splash and welding splatter. In harmony with the various demands, we manufacture the silicone coated sleeve in several models and designs. With all the latest features and modern technologies, the fibre tube is unsurpassed purely based on performance. It is used as protection sleeve in many applications such as industrial hoses, cables and wire, aviation and marine fuel.